At Darlington, we provide a rigorous, college-preparatory program that's global in focus and personal in delivery. With specialized golf, soccer and tennis academies directed by world-class coaching staffs, a full orchestral program, Instrumental Music Conservatory and more than 200 leadership opportunities within the student body, Darlington School offers you more. Here, "child-centered" is not a theory but a practice. Founded in 1905, Darlington is an independent, coeducational, college-preparatory school, serving boarders in ninth grade to post graduate and day students in pre-kindergarten through grade 12. The school is nestled around a small lake on 500 wooded acres in Rome, Georgia, located in the southeastern United States, only an hour and a half north of Hartsfield-Jackson International Airport in Atlanta. Situated on the outskirts of a small, Southern town, Darlington is only an hour's drive from Atlanta and Chattanooga and offers frequent trips to cultural and athletic events, outdoor adventures, theme parks, and shopping centers. Our diverse student body gives students a realistic perspective of the world. Students come from an average of 15 states and over 25 countries each year. Darlington has a long history of educating Aramco students; admission representatives visit Saudi Arabia every year to meet with prospective students and parents. Wisdom more than Knowledge; Service beyond Self; Honor above Everything. Darlington is a family-oriented environment that meets students where they are and seeks to develop them into confident young adults through innovative teaching and child-centered learning. 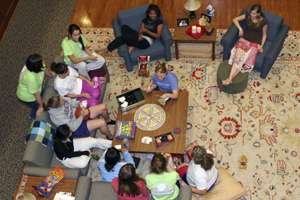 Boarding life at Darlington focuses on an English House System unique among American boarding schools. Students are accepted into one of six Houses, three for girls and three for boys. The First-Year Experience Program focuses on the freshman students and the adjustments and responsibilities that come with adolescence. 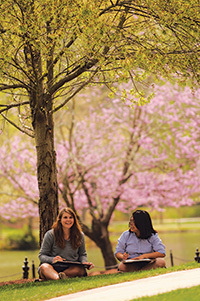 Fifty percent of faculty and staff live on campus, providing teacher/student interaction in and out of the classroom. Student prefects manage the life in the Houses and also sit with the heads of house on the House Senate. At Darlington, 100% of our graduates go to college, and many win lucrative merit scholarships in the process. Over the last five years, Darlington students have been awarded over $43 million in college scholarships. We invest heavily in a coherent curriculum with small class sizes (averaging 14 students), state-of-the-art technology, and most important, inspiring teachers who assign meaningful homework and who conduct imaginative and highly interactive classes. Darlington provides structure and daily coach classes for those who need additional support, while offering greater freedom and challenge to those who have mastered the basics (20 Advanced Placement courses and Honors courses available in all subject areas). Parents and students follow academic progress through confidential student pages on our website. Darlington students expect a lot from one another. Their determination to live in a just community, where trust is more than just a word, is embodied in the school's venerable Honor Code, established by students over a century ago. All 9-11 grade resident students participate in either an after-school activity or on an athletic team, including 12 varsity sports for boys and and 14 for girls. The A.J. Huffman '67 Memorial Athletic Center houses an indoor pool, aerobics room, wrestling room, practice gym, performance gym and state-of-the art fitness room in a 96,000-square-foot space. Darlington has extensive playing fields and six miles of cross-country trails through its 500 acres of wooded hills. Additionally, student-athletes interested in playing soccer, tennis or golf at the next level are invited to participate in our year-round sports academies. Students can choose classes like Graphic Design, Journalism and Cinema. They can express themselves in art and video classes; participate in a musical theater class; or perform in one of The Darlington Players' three annual productions. Ladies' and Men's Chorales; Concert Choir; Wind, Percussion, Guitar and Jazz ensembles; Spirit Band and Orchestra perform on the road and for the school. A month-long celebration of the arts takes place each fall to highlight our students' talents and accomplishments. Additionally, artists in residence visit campus in an effort to share new levels of expertise in visual and performing arts. 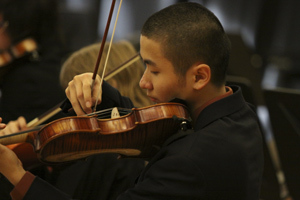 The fine arts department offers an Instrumental Music Conservatory for serious performing artists. Students have an opportunity outside the ordinary in boarding camps from June through August. Campers choose from a variety of specialty sports camps, including soccer and lacrosse. Day campers can enjoy offerings from Robotics to traditional camps filled with fun activities for all ages.